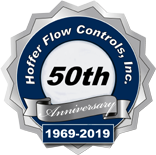 Hoffer Flow Control thanks you for your interest in our products. To better assist you, please fill out this form to receive a quote from a member of our sales staff. Is there a desired delivery on this meter? How soon do you expect to make a decision on this meter? What other manufacturers or technologies you are considering? Is there anything else we need to know about this application that will help us provide you with the best option? How did you hear about Hoffer Flow Controls?